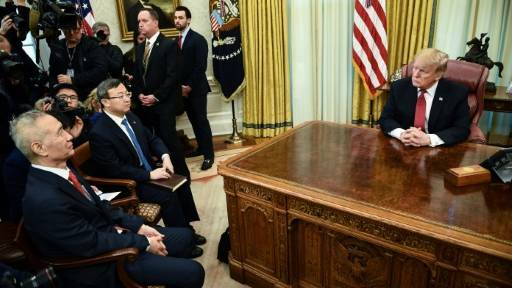 Following trade talks between the Chinese and U.S. teams in Washington, U.S. President Donald Trump met Chinese Vice Premier Liu He in the Oval Office. Trump said the talks were going “very well”. Economic Adviser Larry Kudlow added that “the scope of these talks will be the broadest and deepest in U.S.-China history. We’ve never had anything this comprehensive.” “Important progress has been achieved in the current stage, and the two sides had candid, specific and constructive discussions,” the Chinese delegation said in Washington. A U.S. trade delegation will visit China in mid-February for further consultations. U.S. President Trump tweeted: “Looking for China to open their Markets not only to Financial Services, which they are now doing, but also to our Manufacturing, Farmers and other U.S. businesses and industries. Without this a deal would be unacceptable!” Both sides gave an upbeat assessment as they wrapped up their talks, saying they had covered a wide range of disputes. Donald Trump called Chinese Vice Premier Liu He “one of the most respected men” in the world. Trump also hailed China’s decision to buy 5 million tons of U.S. soybeans, after Beijing bought another 5 million in December following a meeting between the two Presidents at the G20 summit in Argentina. The U.S. tariffs on USD250 billion of Chinese goods are expected to be investigated by the World Trade Organization (WTO), as they are probably “inconsistent with WTO obligations”, according to James Bacchus, the former head of the WTO appellate body. All WTO members are expected to give each other the same tariff treatment. “I believe these U.S. tariffs are inconsistent with WTO obligations, but it will be left to my successors on the WTO appellate body to decide,” Bacchus said. This is China’s second request for an inquiry into the matter. The first one last month was vetoed by the U.S., but the second request cannot be blocked according to WTO regulations. China alleges the U.S. tariffs violate the WTO’s most favored nation provision because the measures fail to provide the same tariff treatment that the U.S. offers to imports of all other WTO members. The U.S. counters that the tariffs fall outside the WTO’s remit because they address trade issues that are not specifically covered under WTO rules. The U.S. envoy to the WTO called the inquiry “pointless” and “entirely hypocritical”. China and the United States are expected to hold one or two more rounds of trade talks to map out a plan to end their tariff war before the March 1 deadline, according to a diplomatic source and observers. The South China Morning Post reports that Xi and Trump are considering meeting in Da Nang, Vietnam, on February 27 and 28, where President Trump might also hold a second summit with North-Korean leader Kim Jong-un. No details of arrangements for those meetings were revealed, and the Chinese Foreign Ministry said only that President Xi was willing to keep in touch with Trump through various means. However, President Trump had written on his Twitter account: “No final deal will be made until my friend President Xi and I meet in the near future to discuss and agree on some of the long-standing and more difficult points”.